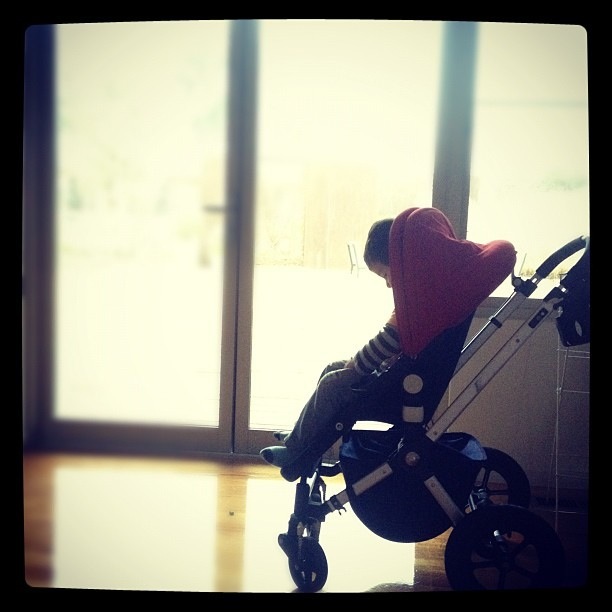 So, our Bugaboo pram has been doing hard work for about 6 years. We got it second-hand when our son was born. It was a beautiful, bright red when we first got it, but over time it has faded unevenly and severely, and then in a terrible oversight, it grew mould that left awful stains. Despite these cosmetic defects, it is in perfect working condition. But, when it comes to babies, a stained, faded, but otherwise clean and working, pram somehow doesn’t seem appealing to that many people (including me). I decided that I would have a go at dyeing it. I figured that no one would want to buy it with the mould stains on it so even it didn’t turn out well there would by no real loss. 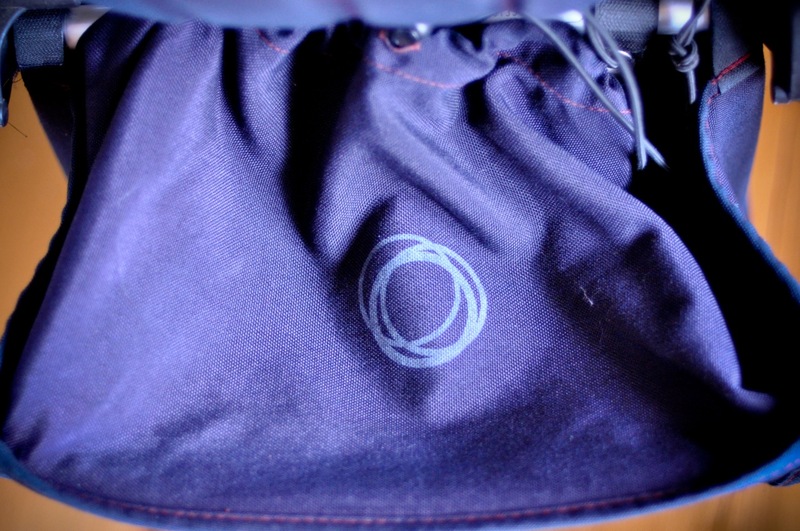 The base fabric (the actual seat and basket) are 100% synthetic so I found a suitable dye- iDye Poly. Nowhere on the packet does it say you should use a machine to dye with this stuff, but I didn’t really have many options. I couldn’t find a pot big enough. I did a bit of Google research and discovered the main problem people had with using it to machine dye was that the water was never hot enough. No problem there for me. My front loader has a 95 degree C cotton setting on it which I could never fathom a use for until today. I also checked, and my model Whirlpool has a heating element in it so it did indeed get up to that temperature. My initial concerns were based around not being able to fit the seat into my machine, or that it would be too squished and not dye evenly. But in the end I suddenly started to be concerned about what would happen when I washed something at 95 degrees when the label very clearly stated it should be washed at 30 degrees. There were plastic and some metal toggs on it too. In the end, I put the seat, the basket and a bright pink canopy (the canvas kind) that I had brought 2 years earlier in to the machine with 2 packets of dye and the colour intensity stuff that came with it. I went for one blue and one black. I had my doubts about anything EVER being dyed a really good black at home, so I thought maybe a navy blue might go well over faded red. It might end up a deep purple/blue/black/(hopefully not) brown. It dyed the seat and the basket perfectly and uniformly navy blue! 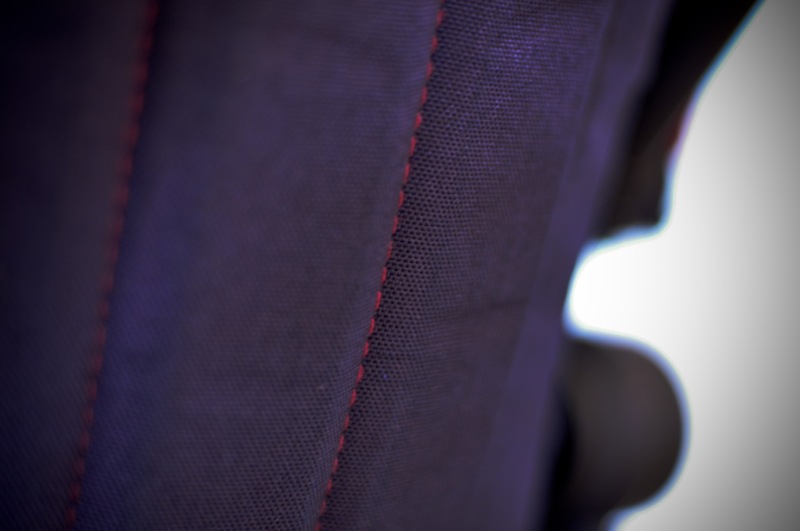 The stitching remained red. The canopy which had felt more plasticky (maybe because it was newer, or maybe made of a different polyester?) did not take the dye much at all. It had darkened a shade. the stitching took a couple more shades. Overall, I’ll let the pictures decide for you. I wish I had taken a photo of the horrible faded red just before I dyed it. Once upon a time if was the lovely vibrant, funky red. The photo with my 19 month old son is sort of the pram’s halfway mark. Then it faded to a really sad tattered looking red…..
You’ll just have to trust me on that. 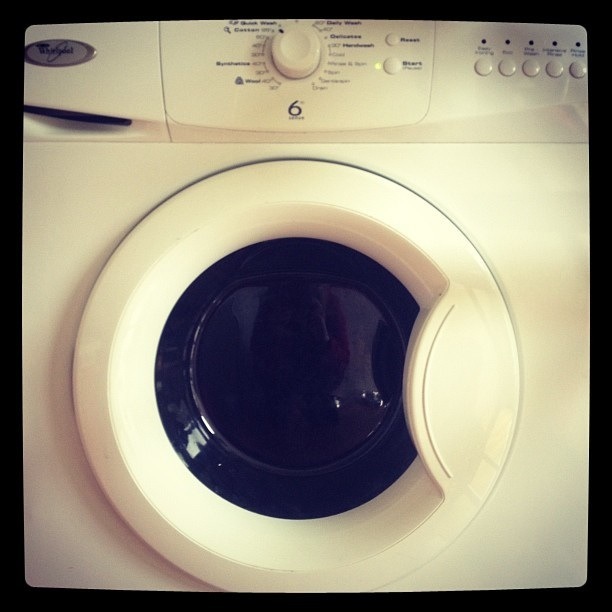 As for the state of my washing machine afterwards? Perfectly fine! i did an empty run with washing powder and straight after that I washed some white sheets without incident. Too easy. I know this is an old blog post, but I am so glad I found it! 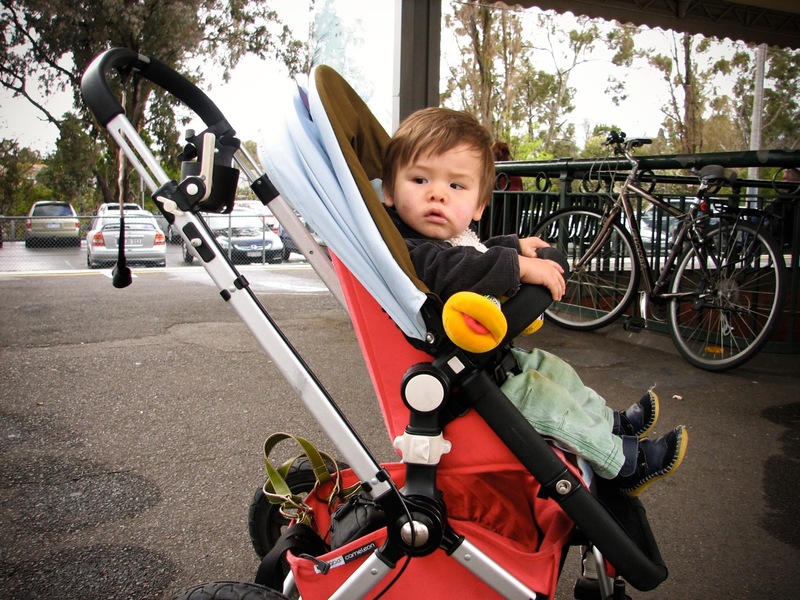 I bought a second hand bugaboo for very cheap. It is in perfect working order as well, except the seat is a faded red. I was hoping I could dye it and then I found your blog! I’m doing this exact same thing today! Did the dye hold up well over time? I’m so glad you found it helpful. Yes, it has held up well. 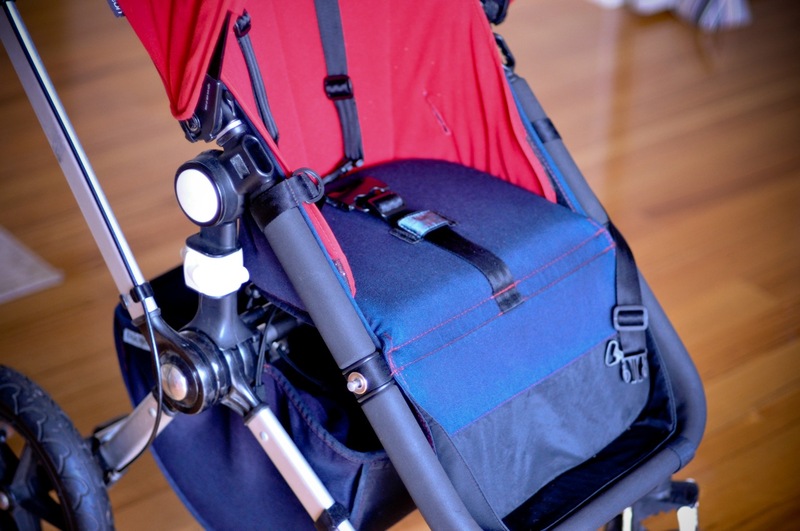 We have actually passed the pram onto some friends who had a baby recently and from the pictures I see, pram still looks great. 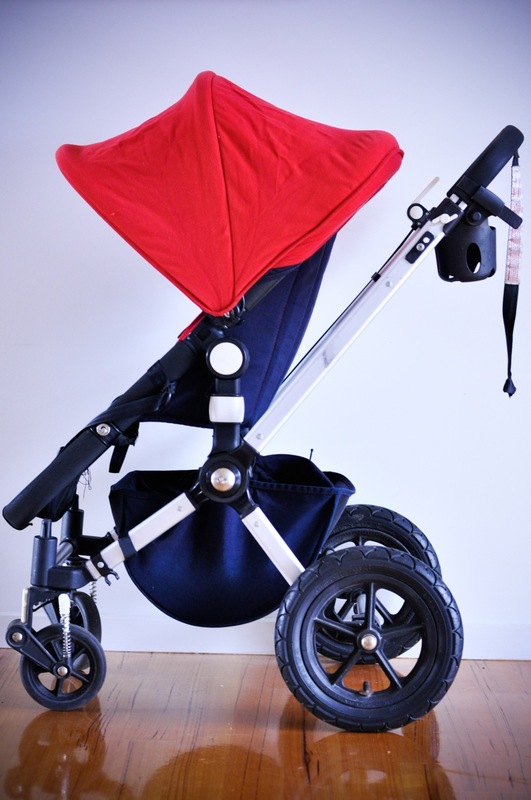 I looked this up a few years ago as I too bought a second hand red bugaboo when my daughter was a few months old, at the time I didn’t want to ruin it bh accident. I’m doing it up for our unborn child as I love it and couldn’t phantom the idea of another pram, my fabrics currently also have some lovely mould growth. I decided I would actually buy some bits on eBay to update it, having bought a black basinette and now I realise it’s apparenty a limited edition so getting a basket and seat unit to match will be more costly than hoped. I was going to go for the dark grey seat unit and basket, now after re visiting the dyeing idea I’m thinking that dyeing from grey to black shouldn’t be such a huge issue, my washing machine has a lively 90 degree cycle that’s one for quite a while so hopefully that should do the trick and it means I won’t have to worry about the fabrics I buy being faded already. 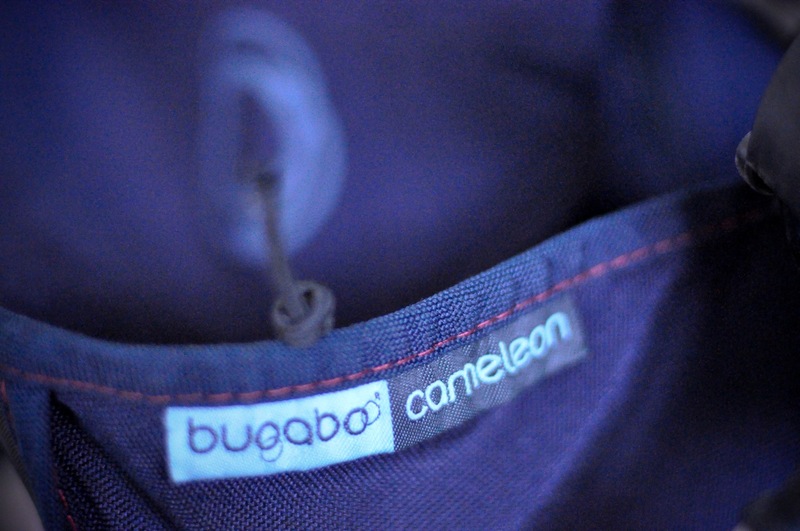 I was also wondering what effect it had on the bugaboo logo on your basket? 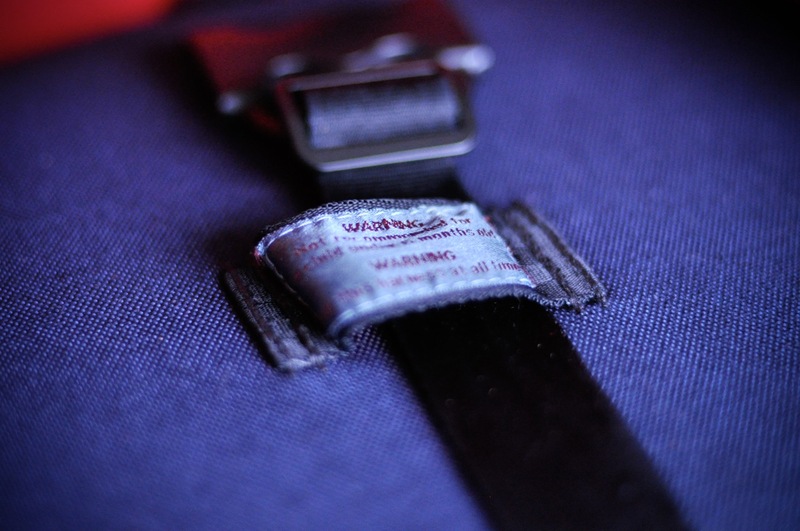 You can see in the pictures that the labels and logo took on a small amount of dye. Thank u for this blog!! Now I’ll go dye my wagon..
Hey, I know this post was from a while ago but just wondering how the colour lasted over time? I’ve just bought a second hand red pram and considering doing the same thing! I’d like to go black but not sure how it would go?? I sold the pram, so I am not sure. My very dark blue turned out great. It wasn’t expensive or hard to do, so if the colour fades just re-dye it! I think that there might have been a bit of heft needed getting the straps back around and on the the little bolt bits near the foot of the seat, but it wasn’t a real problem. I recall another time I took the plastic out of the basket I had a hard time getting it back in. Having said that, my machine only heats to 90, so just be wary of letting your pot actually boil- it might be that little bit too much? Hi, I am so glad that I found this blog post. May i ask if the dye stained any plastic parts of your washing machine? I have a top loader that has a centre piece in the middle which is made of plastic. and it’s WHITE! I dun dare to try before doing as much research as I can, otherwise there would be a very annoying husband……. Thanks in advance! HI! My front loader was metal inside but did have a light grey rubber seal that discolored initially, but after a few washes was back to normal. Good luck! The main thing with dying is keeping the water hot. I say have a go! Making sure you keep it all submerged. I have an excellent condition Frog in which is a little faded and I can’t get replacements so dying is my only hope! Washing powder generally would go? I’m sorry to hear it didn’t work. I can’t imagine why. Were you dying the canvas part, or the stretchy cover thing? Maybe your seat is not poly-perhaps it is a natural fiber! The only other thing I can thing of is that your machine doesn’t have a heating element, which means it just takes hot water out of the tap (which would be no where near 95deg). Good luck, don’t give up!! I just thought, also, if it is originally black and you are dying to black you might not have the greatest results. I used black and navy blue and got a lovely dark blue, but nothing near to black.